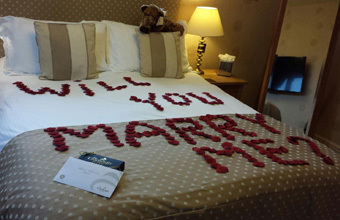 THE Cranleigh Boutique has announced a record number of marriage proposals over the holiday period, with six couples becoming engaged at the hotel since the bells pealed to welcome in the New Year. The luxury hotel, based in Bowness-on-Windermere, was named the most romantic hotel in the UK and third in the world last February, by travel giant, Trip Advisor. Since then, the hotel has seen a flurry of couples booking a stay with romance in mind, and the establishment plays host to more than 100 proposals each year. Owner Stephen Hargreaves said: "We are obviously very much geared towards romance at the hotel, but six marriage proposals over New Year is a record even for us! Both the team and I work extremely hard to create an unique and unforgettable experience at the Cranleigh and this is clearly a contributory factor for those who choose to create their very special and private moments - such as becoming engaged - here."